Masterpieces of art and architecture withstand the destructive forces of time, natural causes, and military conflicts with varying degree of success. As is the case in most countries, an important national challenge for Russia is preserving its historical and cultural heritage. 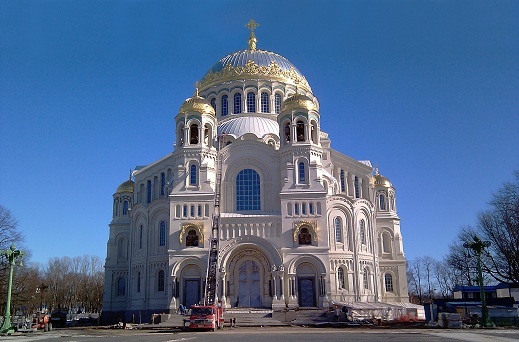 Bum Techno, a SpatialAnalyzer® reseller based in St. Petersburg, recently undertook the challenge of documenting the St. Nicholas Naval Cathedral in Kronstadt throughout the cathedral’s restoration process. The beautiful St. Nicholas Naval Cathedral was consecrated in 1913 in Kronstadt, a suburb of Saint Petersburg. Just ten years after the 1917 revolution in Russia, the cathedral was closed, partially reconstructed, and then used for a variety of general public purposes. At one point served as a cinema, another it was used as a museum. Currently, the cathedral is once again a church and undergoing full-scale restoration with the goal of restoring its original appearance. Bum Techno, specializing in high precision measurement, is responsible for documenting the structural deformations of the building, which is an essential part of the reconstruction of a historical building. To carry this out, the Bum Techno specialists created a large-scale network of deformation reference points. A significant number of reference points are at the basement level, the middle levels of the cathedral, and directly under the dome. The purpose of monitoring is to determine 3D displacements of reference points in a single coordinate system with a high degree of precision. Bum Techno created a measurement system consisting of a laser tracker and two high precision total stations, which were then integrated using SA Ultimate. The geometrical complexity of the building and location pattern of reference points determined the number of stations and their locations. The dimensions of the spatial network were: length = 71 meters, width = 52 meters, height = 39 meters. The measurement process followed this procedure: the tracker was installed in the middle of the central chamber for the entire duration of measurements. Two paired total stations moved around the building perimeter in order to take the deformation reference points (mainly in the basement and middle parts of the cathedral). Periodically, the total stations and the tracker measured common temporary points. Then, the total stations move to the second and the third levels. The total number of stations for a measurement cycle was 16 at the first level, and two stations at the second and third levels, for a total of 20 stations. Using SA Ultimate’s Unified Spatial Metrology Network (USMN) feature provided the ability to align all measurements from all of the instruments, taking into account the differences in their angle and linear accuracy. This measuring and alignment procedure provided at least 0.3 mm accuracy of MPE coordinates. The Measurement Plan feature in SA Ultimate made it possible to automate the data processing and reporting, which is very helpful due to the frequent monitoring cycles (every two weeks). The advanced metrology capabilities of SA Ultimate make it possible for Bum Techno to obtain up-to-date and reliable information on the condition of the building. This data helps everyone make qualified decisions and greatly aids the entire restoration process.